This audio software suite currently includes full-featured digital Audio Mixer and 9 wizard-styled tools - Ringtone Maker, Mobile Uploader, Audio CD Grabber, Audio Converter, Audio Recorder, Audio CD Creator, Music Disc Creator, Clone CD, iRadio Recorder. It supports all major audio file formats: WAV, PCM, MP3, Windows Media Audio (*.WMA), OGG, AAC, M4A, AMR and others. Convert audio between various formats. 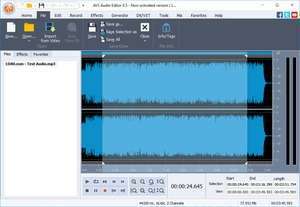 AVS Audio Tools 4.3 is a shareware program and can be used as a demo to try the software until the free trial period has ended. A full version of the program is available after the trial period ends. For security reasons, you should also check out the AVS Audio Tools download at LO4D.com which includes virus and malware tests. Additional screenshots of this application download may be available, too.